"The situation is critical," says Nancy Rodríguez, who runs a produce stand at the Quinta Crespo market in Caracas, Venezuela. CARACAS, Venezuela - The lights are back on at Quinta Crespo, a bustling public food market in central Caracas. 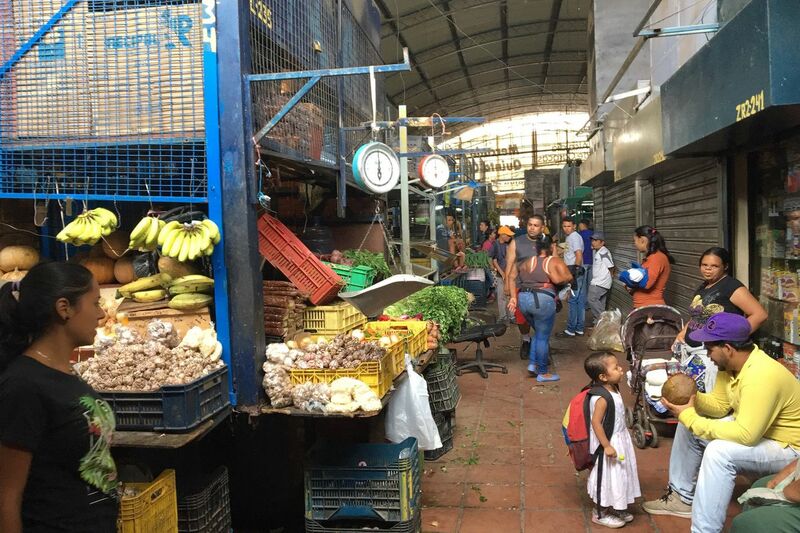 But after Venezuela's worst blackout in history, there's a sense of dread at Nancy Rodríguez's fruit and vegetable stand. "The situation is critical," said Rodríguez, 70, squatting on a plastic stool as customers handled her food, then moved on without buying. "There's already very little production." Already, the economy of this oil-rich nation has shrunk by about half since 2014 - the most precipitous drop in recorded Latin American history. This year, economists expect imports of food, medicine and other goods to plummet by 50 percent or more, as new U.S. sanctions choke off income from Venezuela’s mismanaged oil industry. "We are not returning to normalcy," said Susana Raffalli, the country director for the relief agency Caritas Venezuela. "This is the beginning of a phase in which we'll see a more profound collapse of services in the country." In January, the Trump administration began ratcheting up pressure on President Nicolás Maduro's government, in the belief that it would drive the powerful Venezuelan military to switch its allegiance to opposition leader Juan Guaidó. Most economists blame the country's skyrocketing inflation and acute shortages on falling oil prices, gross mismanagement, and the far-left policies of Maduro and his predecessor Hugo Chávez. But the U.S. sanctions are intensifying the humanitarian crisis. Some economists are predicting famine in this country of 30 million. Others say the outlook may not be that extreme. But most foresee growing malnutrition in a nation where babies are dying because of a lack of food. And migration - already "on the scale of Syria," according to the U.N. refugee agency - is likely to escalate. "Things could spin out of control," he said. Venezuela's already battered economy suffered multibillion-dollar losses during the blackout that began on March 7. In the first two days alone, more than 4.4 million pounds of meat spoiled because of a lack of refrigeration, according to the national ranchers' association. As power shut down, the country's aluminum industry was further crippled: Molten metal solidified and destroyed machinery. When power was restored, leaping voltage burned out computers, air-conditioning units and refrigerators. Transformers blew up. "We are at a point of total collapse," said Julio Molina, head of the electrical engineering faculty at the Central University of Venezuela. Maduro has blamed the power failure on a U.S. cyberattack. Engineers and analysts dismiss the claim. They think it started with a brush fire near power lines or an electrical substation in southern Bolivar state that eventually knocked out the Guri hydroelectric plant - the source of 80 percent of the country’s power. Miguel Lara, a former president of the state-run entity that oversees the electricity system, said Venezuelans can expect "a pattern of blackouts and rationing" in coming months. (Calls and emails to Corpoelec, the government electricity authority, were not returned). The second-tier effects of the power failures could be profound. In many areas, water service still isn't back to normal, because there isn't enough electricity to run the pumps. "Now it just comes once a day," she said. For half an hour. The capital's water infrastructure was already badly decayed, with broken pipes, an aging aqueduct and a lack of reservoir capacity. "The international credits, the huge quantities of money that supposedly were going into fixing the aqueduct, we don't know where they went," he said. (Hidrocapital's media office declined to comment). Maduro claimed last week that he had triumphed in the "electrical war" with Washington. But he also called on Venezuelans to buy battery-powered radios, candles and flashlights and extra water tanks "so that every home is ready." "In four months, we'll be seeing less food," he said. Farmers in his home state of Merida are telling him they have no seeds. Darwin Peña, 25, a fruit vendor in Caracas, Venezuela, worries that a farm crisis will leave him with little to sell. Venezuela's agricultural production had been slumping for years under government price controls and the expropriation of farms. Now, the country's farms can fulfill only about 20 percent of domestic food needs, said Carlos Albornoz, head of the national dairy and livestock association. "We are 30 days from the start of the agricultural cycle, and we simply don't have the inputs, the tools, the seeds," Albornoz said. "An agricultural collapse is absolutely inevitable." Francisco Rodríguez, the senior economist at the New York investment bank Torino Capital, is a native of Venezuela. Unless the political crisis is resolved, he said, "Venezuela is very likely to undergo a famine this year." A man reads a newspaper at a butcher's stall at a market in San Cristobal, Venezuela. "People steal because they can't find any other way to eat," he said. Guaidó, the president of the National Assembly, now poses the biggest challenge to Maduro since he took office in 2013. The opposition leader says that Maduro's reelection last year was deeply flawed, and that he is Venezuela's rightful leader. The United States and about 50 other countries recognize him as president. Maduro has cast Guaidó as a "puppet" and a "clown" attempting a U.S.-backed "coup." But his government is scrambling to contain the economic wreckage. It has asked buyers if it can swap crude oil for gasoline in hopes of keeping gas stations in the sprawling capital from shutting down, said Guillermo Arcay, an economist at the Caracas consulting firm Ecoanalitica. Authorities are prioritizing obtaining gasoline even over diluents, the chemicals that are used to thin Venezuela's sludgy crude so it can be exported through pipes. The Venezuelan money supply - as measured by cash, checking accounts and bank accounts accessed by debit card - is now doubling every month, he said. As for the oil industry, production slipped nearly 9 percent from January to February, to just over 1 million barrels a day, according to the Organization of Petroleum Exporting Countries. That's about half as much as Venezuela was pumping in 2017. "There's a high probability that the worst of the crisis is yet to come," Arcay said.